Cleaning should be done at the purchase location before bringing it home. As a precaution, you may want to pressure wash the equipment again when it gets to your farm. Do this in a commercial truck wash or on the farm in a low-traffic grassed area away from any cultivated soil. This is also a good opportunity to take the time to do a proper sanitation using bleach or Virkon. Read more. Moving soil, moving weeds. Manitoba’s new weed specialist Tammy Jones (Tammy.Jones2@gov.mb.ca) adds that used machinery could also contain noxious weed seeds – another reason to make sure to clean the machine before bringing it home. 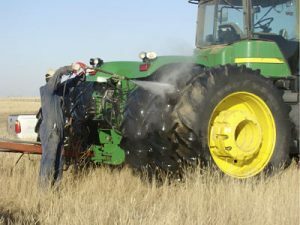 The Saskatchewan Weed Control Act has similar provisions regarding the cleaning of “vehicles and machinery” before moving them between fields.